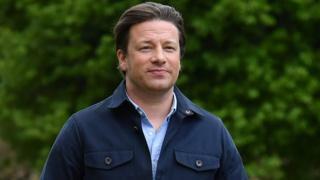 Jamie Oliver chased a man down the street after he allegedly attempted to burgle the celebrity chef's home. According to witnesses, the chef pinned the man down while waiting for police to arrive last Tuesday in north London. It's alleged the man had attempted to break into other houses on the street where Oliver, his wife and five children were all home at the time. The 43-year old confirmed to the BBC the incident had taken place, and looked shaken when recalling the event. Asked on Monday about the ordeal, Oliver was reluctant to comment in detail but told the BBC: "It's not a situation you want to get involved with, it was what it was and it ended OK."
A spokesperson for the Metropolitan Police told BBC News: "Police were called to reports of an aggressive male attempting to gain entry to residential addresses in N6. It's not known why the man was released, but press reports suggested it could be down to a lack of evidence or the suspect having mental health problems. A neighbour told The Mirror: "It was just a brave, selfless thing to do... everyone is really thankful for his quick thinking and courage."